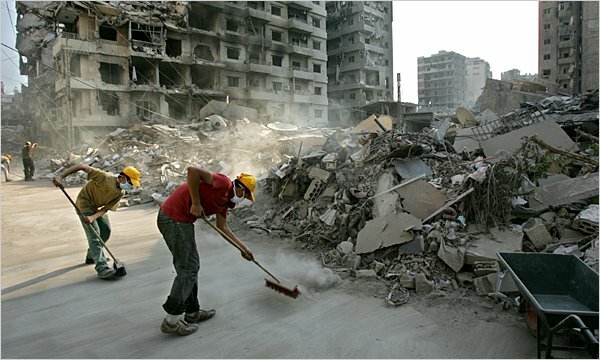 This paper examines the politics of care of international and local humanitarian actors, as well as the social responses to their intervention in the southern suburbs of Beirut (Dahiye) during the Israeli shelling in the summer of 2006. Several faith-based and secular international NGOs and UN agencies rushed to assist individuals displaced by the Israeli air force's heavy shelling; once the large-scale violence ended, some of the international organisations that had operated in Dahiye during the war gradually turned ad hoc short-term relief into long-term development programs. This paper, through in-depth interviews and ethnographic participant observation methods (2011-2013), will illustrate how short-term foreign provision of aid differs from the continuous efforts of some local providers to support their communities on a daily basis, unearth different approaches to states of emergency and responses to crisis and demonstrate how the international-local dyad plays out in a very complex way on the ground. To cite this paper: Estella Carpi, "Politics of Care and Social Responses in the July 2006 War: a Special Focus on Local Faith-Based Organisations*", Civil Society Knowledge Centre, Lebanon Support, 2016-08-01 00:00:00. Several faith-based and secular international NGOs and UN agencies rushed to assist individuals displaced by the Israeli air force's heavy shelling in areas known for having a strong Hezbollah presence. Once the large-scale violence ended, some of the international organisations who had operated in Dahiye at the time of the war gradually turned ad hoc short-term relief into long-term development programs: some of them funded new municipality services by training local staff to employ them in new education programs and health care, while others conducted their own programmes. In particular, I interviewed the Musa as-Sadr Foundation headquartered in Tyre; al-Mabarrat Association founded by as-Saiyyd Mohammed Hussein Fadlallah – often described as the “Spiritual guide of Hezbollah” – and its sub-branch al-Hadi in the Beirut southern suburbs; and, finally, Jihad al-Binaa, one of Hezbollah’s largest NGOs, which is the internationally acclaimed pioneer of the Dahiye postwar reconstruction. Both Fadlallah – following the marja‘iyya doctrine - and Hezbollah have acquired increasing legitimacy from the 1980s onwards, although the two sides were initially in great disagreement with each other. Nonetheless, social change and struggle against “Western imperialism” have been the cornerstones of both Hezbollah’s and Fadlallah’s thinking. Unlike Fadlallah’s approach to aid provision, a local secular NGO spoke of the necessity of cultivating responsibility in Lebanon by charging the beneficiaries for the required services when feasible, with the intent of not providing charity aprioristically. It is in this sense that they argued that they are “the feet and not the head of [their] own society”. The morals of guiding individuals, typical of Fadlallah-founded associations, are lost here. Local secular NGOs generally defined their own work in terms of catalysation of an active and dynamic civic sense already existing within the country. However, in some cases, NGOs deny their political influence on society by delegating politics to the local people. From this perspective, NGOs simply accelerate and support people’s actions, and transform common people’s ideas and intentions into real changes. In this regard, the head of Amel Association, Kamel Mohanna argued that his NGO’s work merely consists of promoting a “culture of rights” - thaqafat al-huquq - which, in current Lebanese society, tends to be rather community-oriented. By reconciling the secular and the “Shi‘a” perspectives, with all due endemic diversifications, Zahir Jalul emphasised the importance of a culture of humanity – thaqafat al-insan - that is still absent in Lebanon. However, the locally reformulated conception of humanitarianism, international-oriented on its surface, is still historically marked by the blood shed by martyrs as well as the individual commitment in the Resistance. The local perspectives of humanitarian assistance at the time of harb tammuz also differed from each other. Many informal and generally small organisations were set up by local residents. For instance, some of Dahiye’s businessmen whom I met, constituting the newly emerged Shi‘a middle class, began distributing clothes, furniture accessories and money to the socially vulnerable “for the Islamic value of doing charity, as it’s written in the Holy Koran”, as Hasan, a Lebanese businessman, affirmed in Haret Hreik. “Of course there are people who became homeless in the July War, but orphans are always around in Dahiye. You always have a reason to help, until the time these people will be able to empower themselves” [for the sake of precision, Hasan uses the Arabic expression yaksab ajar al-ma’ida, meaning until the time one is able to “earn his own living”]. This phenomenon gave rise to a sort of private proliferation of services in the form of organic cultural expressions and religious obligations after harb tammuz: a war that redefined the social strata of the war-stricken areas, and that later empowered some and impoverished others. Mixed economies of laissez-faire inhabit the public space in an aiding-purchasing-selling chain in which subsidies and charity services target only the very poor without a broad plan to generate long-term sustainability. “… ‘z’ are all used to taking, whereas, as a ‘y’, I’m used to giving. That’s so much easier to be ‘z’ [...] If a ‘z’ asks for something, he doesn’t lose prestige and dignity, unlike us [‘y’]. To take and ask is the nature of their faith… I mean, the people you see in some areas to some extent want to be poor, or they wouldn’t get any help otherwise”. Nevertheless, this paper does not want to suggest that international and local (especially FBOs) are embedded in a sterile antagonism. Over the Syrian refugee influx in Lebanon, UN agencies – especially UNDP – promoted cooperation and coordination with local and international FBOs, pointing to the lessons learnt in the years before. Thereby, international development agencies and the humanitarian afflatus attempt to find their own place as technocrats within the social fabric of domestic charity work, which, in Lebanon’s history, is mostly faith-based or community-oriented. Didier Fassin and Richard Rechtman, The Empire of Trauma. An Inquiry into the Condition of Victimhood, Princeton, NJ, Princeton University Press, 2009. It is worth specifying that the differentiation of experiences contributes to the upgrading of the NGO workers’ career. Indeed, emergency complexes tend to create further spheres of professionalisation in Lebanon and elsewhere for internationals and local middle and upper classes (Adam Hanieh, “Shifting Priorities or Business as Usual? Continuity and Change in the post-2011 IMF and World Bank Engagement with Tunisia, Morocco and Egypt”, British Journal of Middle Eastern Studies, Vol. 42, No. 1, 2015, pp. 119-134). Leila Zakharia and Sonya Knox, The International Aid Community and Local Actors: Experiences and Testimonies from the Ground, the Civil Society Knowledge Centre, 2014, Lebanon Support, available at: http://cskc.daleel-madani.org/paper/international-aid-community-and-local-actors. [Last accessed June 16 2014]. Fadlallah founded al-Mabarrat Association in 1978 to provide a library, education services for orphans, a hospital mosque, and a dispensary. Not all of these facilities were funded by Iran as often believed (Mona Harb, Le Hezbollah à Beirut (1985-2005): de la Banlieue à la Ville, Paris, France, IFPO-Karthala, 2010, pp. 45-46); they had been set up with the purpose of enabling people to engage in social activities and actions, on the conceptual basis of employing al-multazimun (“committed people”). Fadlallah, known for having issued quite modernistic fatwas at al-Hassaneiyyn Mosque in Haret Hreik, also used to hold a phone line where anonymous people could call and ask for consultancy about daily Muslim practices. A marja‘iyya is a religious Shia institution: Hezbollah independently follows the Khomeini doctrine under the Wilayat al-Faqih, which represents the fusion between the religious and the political, and leads the Twelver Shi‘a community till the end of all eras, when the 12th hidden Mahdi – sahib az- zaman, the “Patron of Time” – will come back to liberate the Shi‘a from oppression once and for all. It is worth getting deeper into the Zeinab figure as a source for inspiration: women activists, however, cannot equate her. The way Lebanese Shi‘a women look at this figure is therefore induced by social circumstances, which are different from Iran. This leads to a theoretical dissent about the Weberian conviction that religion is a key factor in influencing reality. Furthermore, the preaching of Imam Mohammed Fadlallah – called marji‘ at-taqlid (the “point of reference for tradition”) - widely contributed to the empowerment of women in terms of religious roles: he used to say that women can attain the highest level of jurisprudential training and interpret religious tenets, despite the absence of such a norm in Shi‘a jurisprudence (Lara Deeb, “Emulating and/or embodying the ideal. The gendering of temporal frameworks and Islamic role models in Shi‘a Lebanon”, American Ethnologist, Vol. 36, No.2, p. 251). Even so, the normative moral womanhood was majorly represented by Fatima, a model of calm, maternalism and patience, in opposition to the westernised women in Iran in 1971, as specified by Iranian scholar ‘Ali Shari‘ati. In that frame, women were called to actively participate in political life only during moments of crisis, and this implied a changing gender role for women in daily life, with respect to the more static figure of Hussein, who epitomises the inspirational model for Shi‘a manhood. This also occurs as the provider-recipient relationship is based on a social contract or reciprocity in Dahiye. The politicisation of services, therefore, merely expresses the already existing moral and social relationships between the two parts. In particular, during Lebanon's civil war, Fadlallah used to speak up for the necessity of creating a "human state" - dawlat al-insan - that would provide the resources for people to help themselves and one another. He was known for considering public funds as ownership of the people and for capturing this ethics when he said that he was not looking for “followers” but “partners” (Ken Silverstein, Hezbollah's Strength derives from the Strong Social Fabric that they have woven over the years, 2007, available at: http://newsgroups.derkeiler.com/Archive/Soc/soc.culture.iranian/2007-03/msg01663.html [Last accessed October 3 2011]. It is this specific political logic which allowed the Hezbollah party to foster its politics of inclusion.